LED Panel Ultrasonic Generator Controller that works with generators SMUG200W2068ND SMUG200W80132ND and SMUG600W2068ND. IT IS INCLUDED ON THE PRICE, AND SHIPPED WITH THE ABOVE GENERATORS. IT IS NOT, NORMALLY, SOLD SEPARATELY. It allows for manual control of the generator's output power and to turn it ON or OFF using the switch of the LED panel. It also gives the freedon to programm the generator to turn OFF after a predertermined length of time. You can program it, lets say, for 45 minutes, turn it ON and the timer will turn the generator OFF after the 45 minutes expire. Each of the 10 LED bars divisions represents 10% of the total generator power. So if you have four sections lit it means that the output power is currently 80W on a 200W generator or 240W on a 600W generator. 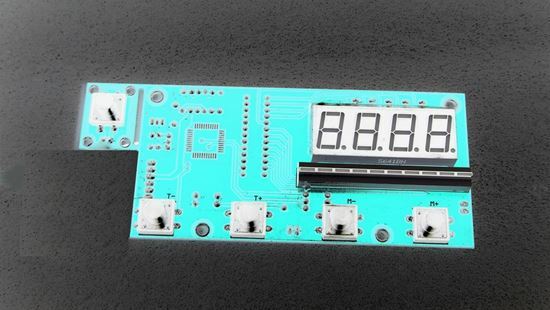 Free Shipping for the LED panel when purchased with any other product.